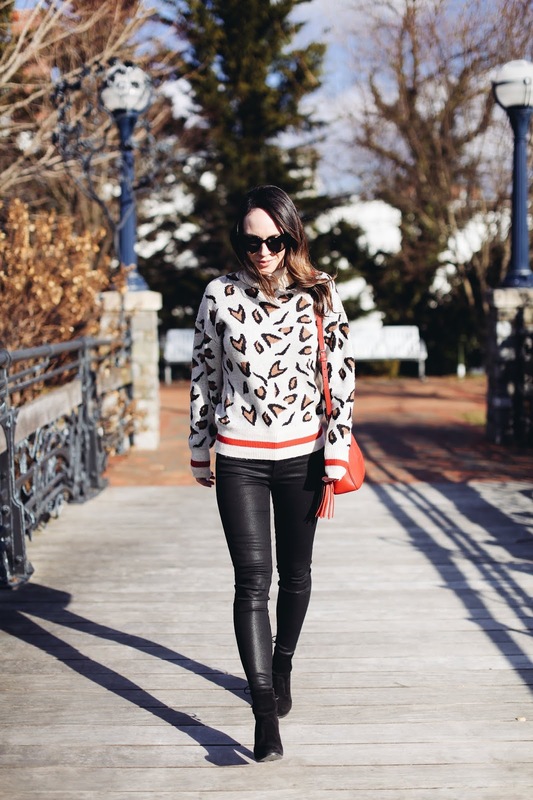 Leopard print, black and red all in one outfit! Nothing makes me happier. LOL I love black and red together and leopard print is always a favorite so putting them all in one look seemed like the perfect idea. 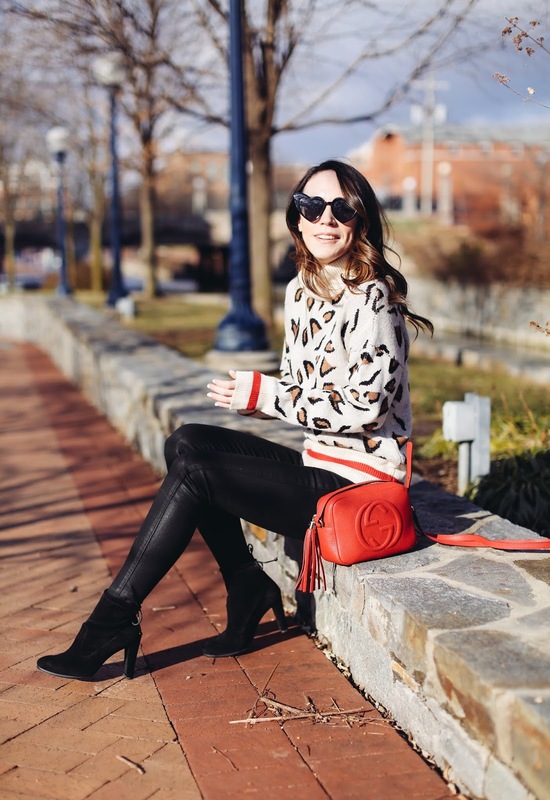 I've received tons of messages from those of you that have purchased these coated jeans after hearing me go on and on (and on and on) about them. They are hands down my best jeans purchase all season. This was my favorite pair of jeans I bought in the fall that I have worn here, here and here and these coated jeans are my top denim purchase this winter. They are high waisted, very slimming (and almost have a spanx-like effect sucking everything in) and the ankle is super fitted which makes it easy to tuck into ankle boots or OTK boots. Plus they look like leather pants at a fraction of the price. For sizing reference, I took my regular size in them. Now on to the other half of this post that is not fashion related - the books I recently finished! Wow - I just realized that I went through all of these books in the past 3 weeks. Yowza! But to be honest, listening to audiobooks is so relaxing for me so I often choose to do that instead of watching TV most nights. There weren't any duds in this bunch, but I definitely had a few that I liked and a few that I LOVED. 1. The Other Woman - This was my favorite book out of the bunch. Emily and Adam are in love and their relationship seems to be moving towards marriage. Then Emily meets Adam's mom. She creates more and more obstacles for them, and Emily doesn't understand why. I was so annoyed with Adam's mom throughout the entire book and kept reading just to see why she was being so difficult. But I did not see the ending coming and it really shocked me. I love when books do that! 2. The Tattooist of Auschwitz - Based on the true story of Lale Sokolov who was imprisoned at the Auschwitz concentration camp. He was fluent in many languages so the guards quickly put him to work as a tattooist responsible for tattooing new prisoners arriving at the camp. During his time at the camp, he meets Gita and they fall madly in love during their years there. This book shares their story and their time after the camp and how they managed to find one another again against all odds. 3. Cancel the Wedding - This book had all the parts required to make a great novel, but I felt it fell flat. I liked reading it but it didn't keep me captivated. It's been a year since Olivia's mom passed away, and on the surface things seem to getting better for Olivia. She has a thriving career and a loving fiance, but feels compelled to travel back to her mother's hometown in Huntley, Georgia to find out why her mom wanted her ashes scattered there. Olivia knows little to nothing about her mother's childhood or her life in this small town and wants to know what her mother was hiding. 4. An Anonymous Girl - This book has been getting a ton of buzz and rightfully so. It's a very unique storyline and one that kept me guessing through the entire book. Jessica signs up for a psychology study at a local university which she thinks will be a way to make some quick money. Dr. Shields is conducting the study and takes a liking to Jessica and tries to convince her to participate in more aspects of the study. Soon the study begins to take over Jessica's life and she feels like Dr. Shields is running her life. 5. November 9 - Another Colleen Hoover winner! I absolutely love her books and though they tend to have a similar feel, I still enjoy reading them. This one threw a major curve ball halfway through the book that I did not see coming which really made me want to finish it. Ben and Fallon meet the day before she is moving cross-country and have an instant connection. So they decide to meet up the next year on the same day to see if they still have feelings for each other. This tradition continues for the next few years but life begins to get in the way and threatens to derail their plans to ultimately be together one day. I absolutely adored this book and can't recommend it enough. Here are the other Colleen Hoover books I've read and reviewed on my blog. 6. The Perfect Couple - This book is a mystery in theory but not 'an edge of your seat' gripping one, though I still enjoyed reading it. Celeste and Benji are scheduled to be married at Benji's family's lavish Nantucket estate, but before the ceremony even begins the maid of honor is found dead. The local police begin an investigation into this seemingly perfect wealthy family only to discover many things (and people) are not what they seem. 7. Ghosted - I wanted to love this book but only ended up liking it. Sarah and Eddie have an instant connection and fall madly in love after only spending 7 days together. Eddie leaves for vacation after their week long lover affair and promises to call her while away. But Sarah never hears from him again. She desperately tries to understand why he has ghosted her and fears something awful has happened to him. I figured out the ending of this book halfway through but was still able to enjoy the remainder of the book. See all my previous book reviews here.